Our Owl P82 Dual Gel System is one of the easiest systems to run and produces flat even banding and crisp resolution. The system can run two (W x L) 10 x 10 cm gels or one single gel when used with a blocking plate. The design allows gels to easily be placed into the device. A wedge is placed in front of the cassette(s) providing even pressure against the leak proof gasket and places the cassette(s) in the proper running position. Two sizes of wedges are provided to accommodate varying thickness of precast gels. No cooling is required. This system will accommodate (L x W) 10 x 8 cm gels utilizing the provided adapter. Use precast acrylamide gels or pour your own gel, the system easily accommodates your changing needs. 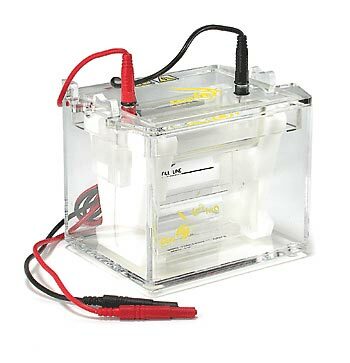 The device is manufactured using Owl’s time tested acrylic fabrication technology.